I was looking at properties for sale located in the several Sand Lake Hills subdivisions when I noticed something peculiar - the real estate agents list HOA fees for neighborhoods that don't have an HOA. I have written in the past about the unethical behavior of some agents like Paul McGarigal and the insistence by a not-for-profit corporation Sand Lake Hills Homeowners Association, Inc. (SLHHOA) in the past, but I thought this information was interesting because there is no where in writing that states a home in any of the Sand Lake Hills neighborhoods owe a HOA any money except for the Amended and Restated Covenants that the SLHHOA recorded with the county, but those documents are meaningless considering they violated the terms of the original covenants and restrictions, not to mention the insistence that the SLHHOA is a voluntary organization yet they are continuing to try to extort money from unknowing homeowners. Their lies are allowed to perpetuate because of people like Joe Royall from Solaire Realty. I don't know if Royall understands the issues involving the SLHHOA and their fees, but I suggest he quickly become acquainted with what is going on in the neighborhood where he is selling homes because what he is doing amounts to false advertising to say the least. 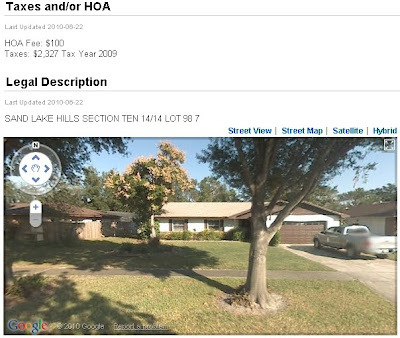 I challenge Royall to find somewhere in writing that a property in Sand Lake Hills Section 10 owes SLHHOA $100. I bet he will come up empty handed because the figure is nothing but a lie. The SLHHOA has been pushing this myth that they are the legal association for every section, which has gotten them into some legal hotwater, dragging the association and almost one hundred homeowners into a legal battle with a particular property owner. If someone were to conduct just a little bit of research, they would realize that there are only a couple organizations established for parts of the Sand Lake Hills community. The Sand Lake Hills Property Owners' Association, Inc. was the HOA for SLH Section 1, but they changed their name to East Bay, and the Sand Lake Hills Section Two, Homeowners Association, Inc. changed their name dropping the "section" to give the appearance that they are the HOA for the entire neighborhood when legally, they are not. Notice how there is an association for Section 3? Notice how there is none for Section 10? Glad you enjoyed the post. If you aren't familiar with this blog, I frequently write about HOAs, and in particular, the problems associated with having a private government run by unqualified volunteers. My Stumbleupon is (tgnetz) and Twitter is (midnightreview).